In the Classics department we encourage our students to use the ancient world, in all its variety, as a springboard for exploring and understanding our own similarly complex and diverse world. Whether you are interested in languages, literature, art or politics, the Classical World profoundly influenced western civilization, and to study its works is to discover a lot of what makes us who we are. 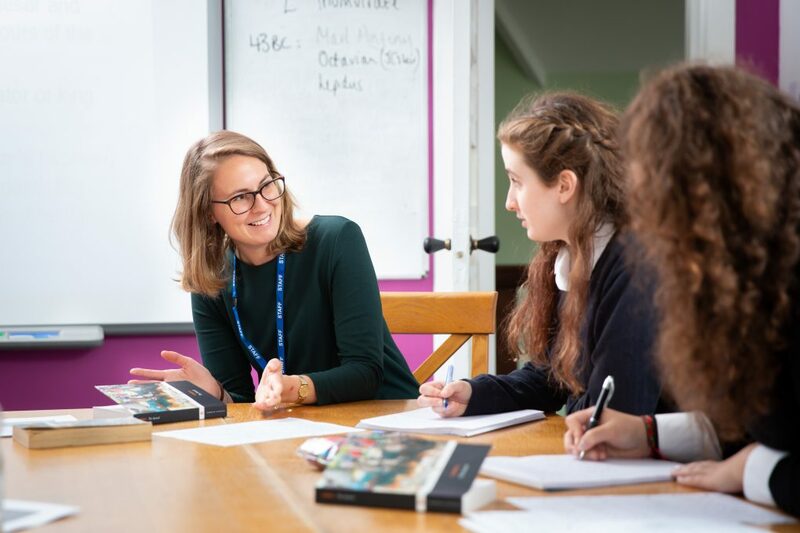 Depending on the talents and interests of the student, each girl has the opportunity to study Latin, Greek, and Classical Civilisation throughout her time with us. She will develop the analytical skills required to learn these complex languages, and will then be able to access the literature, culture and politics of two civilisations which have profoundly shaped our own. More than that, by studying the thoughts of Romans and Greeks in their own languages, we help students to gain a critical distance from their own world, vital to developing an understanding of today’s multicultural society. Alternatively, for those who prefer to study the classical world in all its variety, our pupils can follow classical civilisation courses. From sculpture to vase painting, from history and culture of 5th century Athens to the archaeology of Pompeii, and from Greek drama to the epics of Homer and Virgil in translation, our pupils truly are preparing themselves for life. Our girls achieved amazing GCSE results this year. 100% of Latin grades were 9-7 whilst 70% of Classical Civilisation results were A*-B.
Latin commences in Key Stage 3 using the Cambridge Latin Course. A basic understanding of the function of nouns (cases and declensions) and the nature of verbs (tense and person) is introduced, while building fluency in reading through the medium of stories based around the life of Caecilius and his family living in Pompeii before the eruption of Vesuvius. Excellent background material in English helps students put their knowledge of Latin as a language into the wider context of an understanding of Roman culture and civilization. Greek is introduced in Key Stage 3 using John Taylor’s book: Greek to GCSE part 1. After mastering the alphabet, and building up a core vocabulary, grammar and syntax are acquired in incremental stages along side passages for translation and comprehension. Background material in English puts students’ linguistic skills into a wider context of the literary and historical understanding of the Ancient Greek world. Classical Civilisation is introduced in Key Stage 3 as a topic-based course for the non-linguistic. It largely explores the Ancient Greek world through key areas such as Drama; the Gods; myths; Democracy; the role of women and slaves; education; art and architecture and explores the influence that these have had on our own civilization.